Living... in fear. The undead have risen and are after Carl and his family. 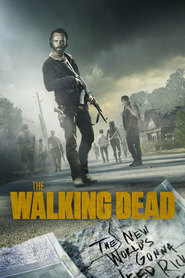 In a post-apocalyptic Atlanta, Carl and his mother go on the run while his father, Rick, is trapped in a coma in a prison. His dad’s old police partner Shane wants to act as a father figure to Carl, but that leads to all sorts of tension when Rick miraculously shows up alive. Profession... doing whatever he can to help the camp, even if it’s not a lot. Right after the apocalypse, Carl is the one being protected. But as he grows older and sees terrible things happen to those he loves, he tries to become more assertive – going on supply runs and hunting walkers. Interests… comic books, which provide a little escape from his bleak environment. He wears a Science Dog t-shirt and reads superhero books like Invincible. Even though his real life has become a science fiction nightmare, at least in the comic books he reads, the heroes end up winning. Relationship Status... Carl has a crush on Beth, as survivor a few years older than him. He very honorably offers to share a cell with her when the camp stays at a prison. “I was just making sure she was safe,” he says, but really he just wants to be close to her. Challenge... holding his own when in reality, his camp would be better off without him. He realizes he’s a liability, and works hard to toughen his resolve. But until he can hold his own with his father, he can’t help but feeling if the camp is overrun with walkers, he’ll just hold everyone back. Personality... sweet and kind, but growing tougher and more cynical each day. Most teenagers want to become more independent, and that doesn’t change when seeing zombie decapitations becomes part of your day-to-day life. But as he becomes more active in his survival, he still provides love and reassurance to his fellow survivors, because in this terrible new world they live in, they’re all they’ve got. Carl Grimes's popularity ranking on CharacTour is #919 out of 5,000+ characters. See our top-ranked characters and read their profiles.